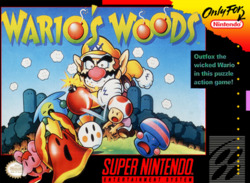 Wario's Woods for Super Nintendo has you as Toad as you try to catch and line-up items such as bombs, monsters, and goblins to eliminate them. Similar to TETRIS, you'll run the field to catch pieces to earn big points. When a level is completed, another, more challenging, level has to be cleared. For 1-2 players.